At the beginning of October 2016, Gold/USD dropped sharply and violated several important technical levels. From MA200, we suspected a bounce would materialize, and posted $1310 as an important level for Gold/USD to regain in order for its price prospects in the nearer terms to look better again. However, it topped at around $1305 (in the LBMA price series which is what we do our analysis on…), and initiated a steep drop. In early December, there were signs that the decline was quite overdone, as well as some positive divergences beginning to manifest. We notified our readers of these beginning signs, but it wasn’t until the 2nd half of December that our conviction rose. I personally entered a position in the gold mining stock Semafo Inc. traded at the Stockholm Stock Exchange, at 26.73 on the 14th. Not a perfect entry… but… we’ll get back to it. During the last few days before Christmas, as well as immediately, several technical signs made me almost 100% certain a bottom had occured in Gold/USD and that a move towards $1200 was in the cards. $1200 was achieved during the trading session of 2017-01-12. All in all, this was a fairly accurate series of calls on Gold/USD. Admittedly, Gold/USD is in a market phase with decent predictability, and will probably remain so for much of 2017 and possibly all the way to 2019, if the market patterns I currently have in mind play out more or less as expected. Alas, what I believe and what the markets will do, are different things. 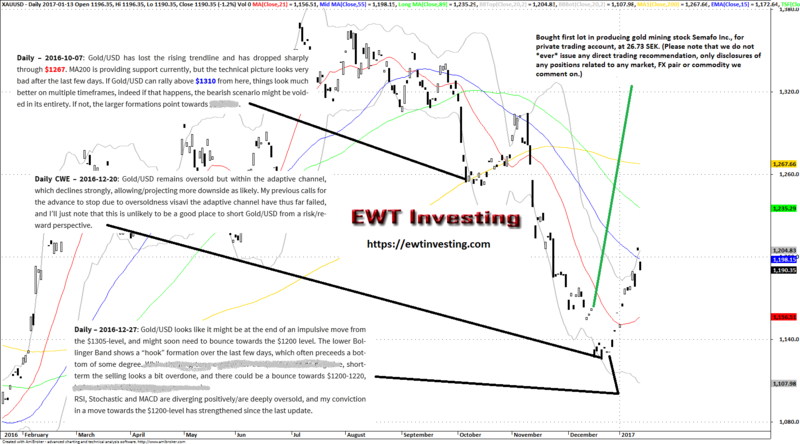 In every analysis section available to subscribers to EWT Investing, we attempt to assess the predictability of the market/FX pair/commodity in question. Unfortunately, predictability varies over time, and understanding this is to understand a core truth of how markets operate. Also, we can only assess predictability subjectively. There are no “objective” market analysis systems anywhere, ever. If you hear anyone talk of any indicator or system being 100% objective, watch out. Trying to be objective, is not the same as actually being objective. Regarding my trade in Semafo Inc., it is currently up +22.66% as of the market close 2017-01-13, due to the rally in Gold/USD, which is a nice gain for the approximately 1 month I’ve held it for – but it suffered a few red days initially, due to my not-entirely-perfect entry. But perfect entries and exits are disappointing goals to have, in my humble opinion. If you want to trade stocks related to commodity prices, make sure the stock tracks the commodity price in question fairly well, and that it is a producing company, rather than a prospective one. Ideally, the stock should also pay dividends, but it is certainly not necessary.